Novice: Hey dude, so what’s better here, A or B? Expert: Hm,…, er,… C. Novice: What? Why??? Expert: Trust me. Novice: Year, right… What is this all about? It is about the Dreyfus Model, which lists stages in skills acquisition that apply to most domains – including Go, I believe. It explains, among other things, why professionals don’t seem able to explain to us the reason behind their moves, and why we shouldn’t be frustrated with this. I wrote an article on this. Today was the final in the North American Fujitsu Qualifier – the tournament to decide who’s representing North America at the Fujitsu international Go championship. Jie Li, who is an amateur, defeated Mingjiu Jiang who is 7 dan pro. Jie Li has won many games against professionals – most recently a best-of-3 match against Feng Yun 9p – including victories in the past against Mingjiu, and against Jiang “Jujo” Zhujiu 9p (Mingjiu’s brother). In today’s final game, Jie Lie started by playing a calm, solid game, and strangely it was Mingjiu who seemed to try to push and complicate things, and got himself into trouble. 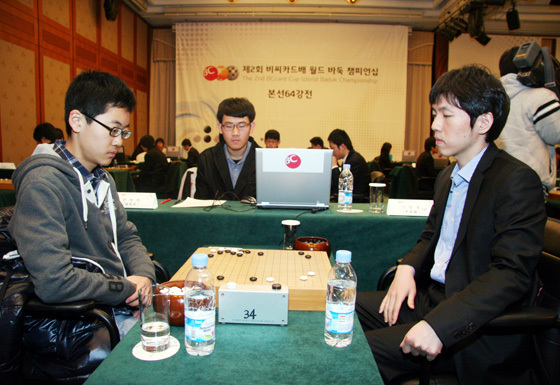 Maybe the psychological pressure influenced Mingjiu’s game in a negative way – having lost to Jie Li before, and given that Jie Li has an amateur status, and that a pro isn’t supposed to lose against an amateur… The game was very exciting, a lot of fighting: a big group of Mingjiu’s died pretty early on, and he tried next to catch up by attacking several groups of Jie Li’s, but that didn’t work out well. First and second rounds of the Fujitsu Cup will be played at the Nihon Ki-in, on April 14th and 16th – looking forward for some exciting games. Go, Jie Li!